Many of our homes have been internationally recognized with awards and achievements. From single-level homes under 2000 square feet to luxurious and expansive homes over 10,000 square feet, we work hard to deliver you the best product. 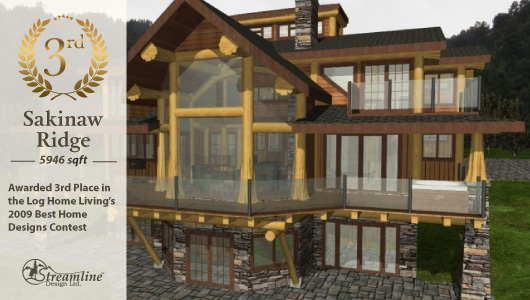 Honorable Mention in Log Home Living’s 2010 Floor Plan Design Awards. 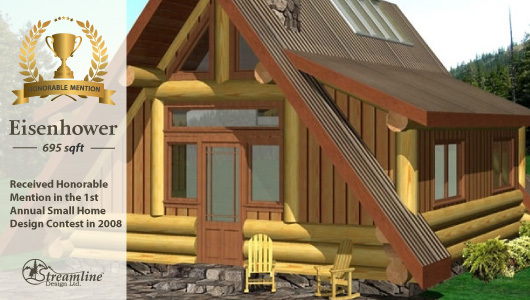 Runner Up in the 2009 Best Log Homes Awards for Best Single-Level Floor Plan. 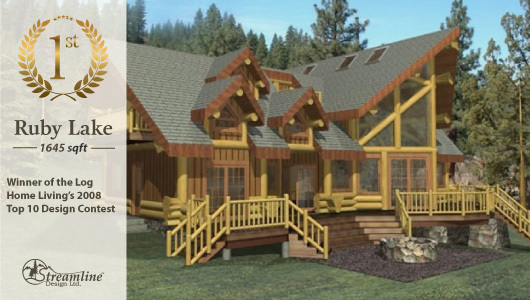 Winner of the 2007 Log Home Living’s Design Contest, the Cleveland Log Home has a cozy, open plan with beautiful vaulted log ceilings throughout. The Cortes exudes tremendous character. 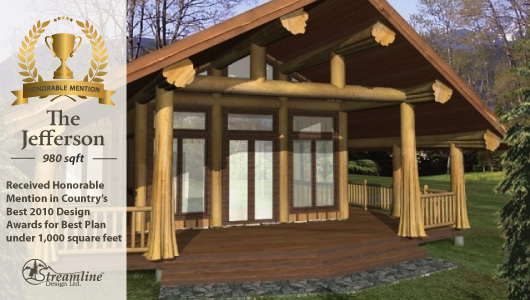 From the flared log posts and purlins to the large, unique window configurations allowing access to a full 270 degree view, this log cabin is designed without a ridgepole to allow for a full length ridge sky light over the great room and loft, allowing natural light to pour in…. 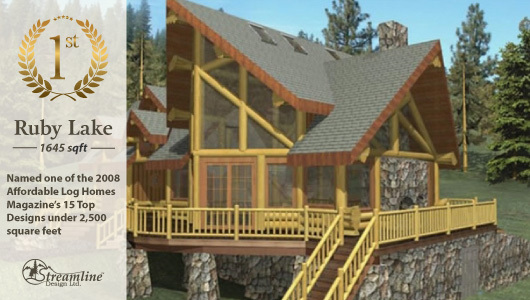 Awarded Best Project 2007 by the International Log Builder Association. 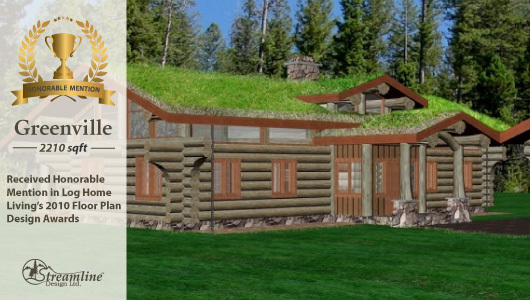 Receiving an Honorable Mention in the 1st Annual Small Home Design Contest, the Eisenhower delivers your traditional one and a half level log house design. 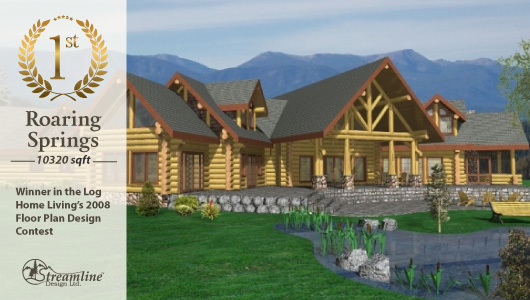 Winner of the 2009 Country’s Best Log Homes Design Awards for the Best Environmentally Sound Design, the Greenville Log Home is designed to be completely self sufficient and off the grid. 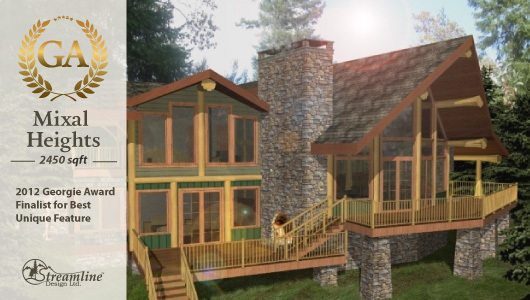 Receiving an Honorable Mention in Log Home Living’s 2010 Floor Plan Design Awards, the Greenville Log Home is designed to be completely self sufficient and off the grid. 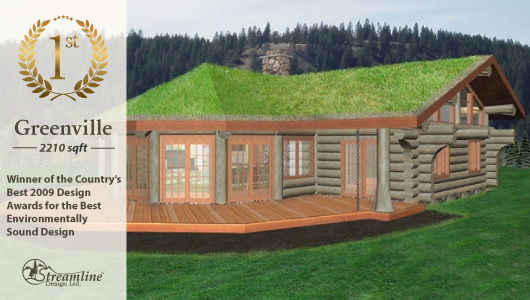 Runner Up of the 2009 Country’s Best Log Home Design Awards for Most Creative Bathroom. 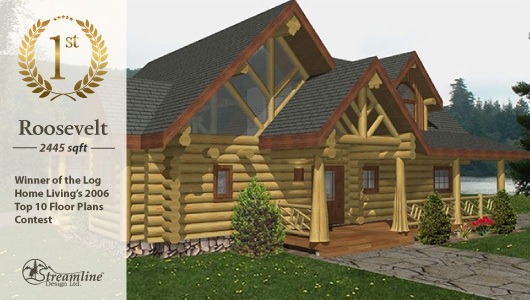 The focus for this traditional log home is form and function, while, at the same time, allowing you to enjoying the simple luxuries and the rustic style so unique to a full scribe log home. The Roaring Spring demands respect, if not for its shear size than for its intricate use of area and maximum viewing area while incorporating the utmost luxury in every facet. This spacious yet modest floor plan was designed with careful thought and consideration for its surroundings. 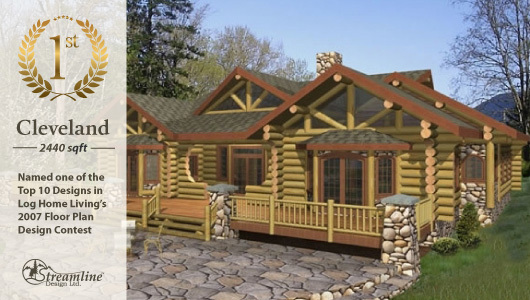 Winner of the 2006 Log Home Living’s Top 10 Floor Plans, the Roosevelt Log Home has tremendous character yet maintains a simple, open plan concept. 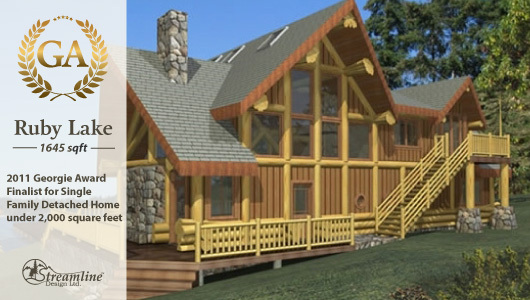 The Ruby Lake Log Home is one of the Affordable Log Homes Magazine’s 15 Top Designs under 2,500 sq. ft. 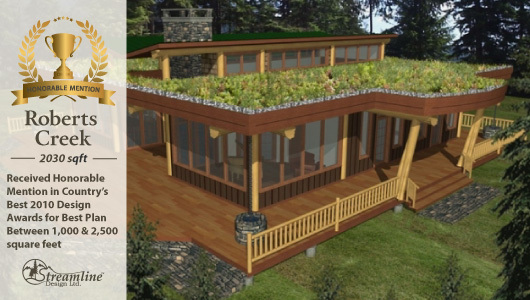 It is a well-planned, efficient home that utilizes space and creates space while wrapping the home in extensive views. 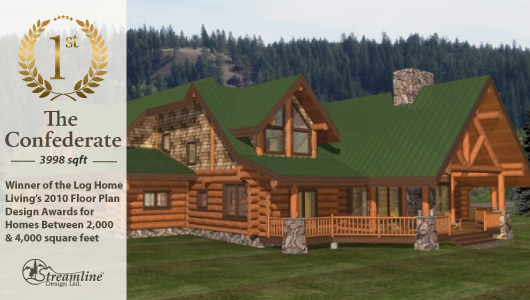 Winner of the 2008 Log Home Living Magazine’s Top 10 Design Contest, the Ruby Lake Log Home is our most popular plan. 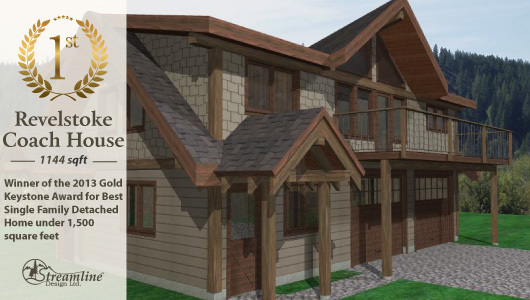 The Sakinaw Ridge timber frame plan was originally designed for an oceanfront property. Because of its popularity, over the past year we have designed five modified versions for other types of properties. 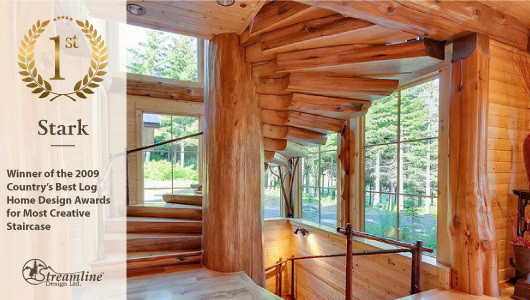 Winner of the 2009 Country’s Best Log Home Design Awards for Most Creative Staircase. 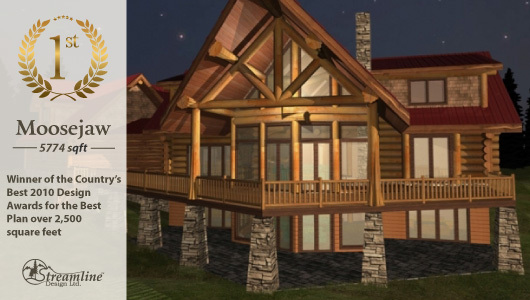 Winner of Log Home Living’s 2010 Floor Plan Design Awards in the 2,000 to 4,000 square feet category, the Confederate Log Home uses space effectively to create private areas amid the openness. 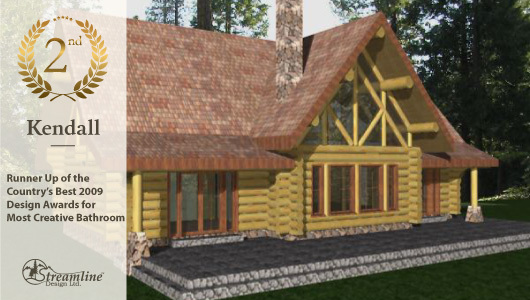 This plan is a reminder of the simplistic rustic style log/timber frame house of days long ago. 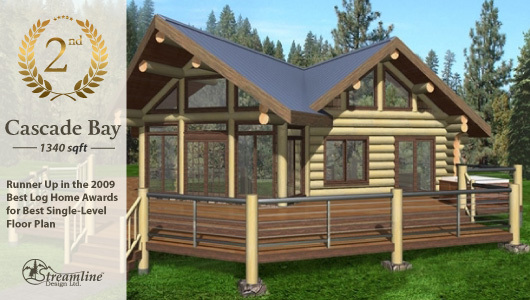 The combination of the open and efficient layout, the log style characteristics and the cozy feel of a traditional style log cabin, make this the perfect get-away home. Initially the intent for this space was an exterior shower. Following the site clearing and blasting, however, it became evident that the natural rock formation and location deserved a more impressive feature. 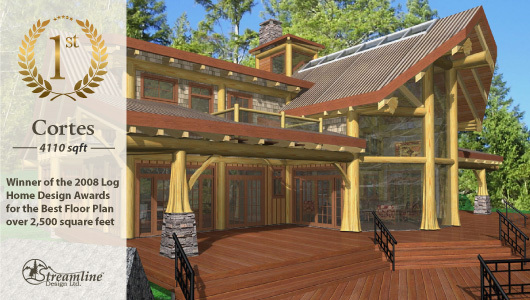 Our Davis Bay Timber Frame Design was a 2012 Georgie Award Finalist for, ‘Custom home Valued Between $750,000-$1,500,000. 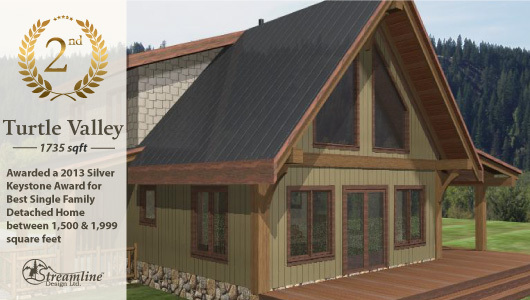 A simple, open plan concept within a single gable (‘A’ frame) roof line. 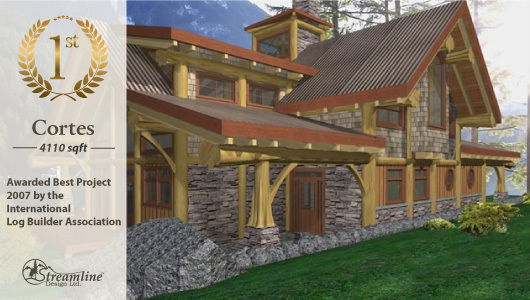 By far our most popular plan, the Award Winning Ruby Lake timber frame house design truly is a gem. This two-story home immediately greets the eye with expansive views and spacious living. 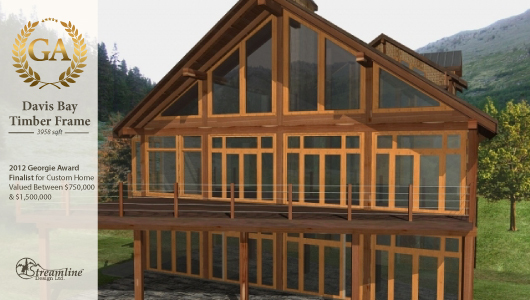 Efficiency is the cornerstone of the Ruby Lake timber house plan.